Huawei launched its Honor 8X Smartphone in India this week. 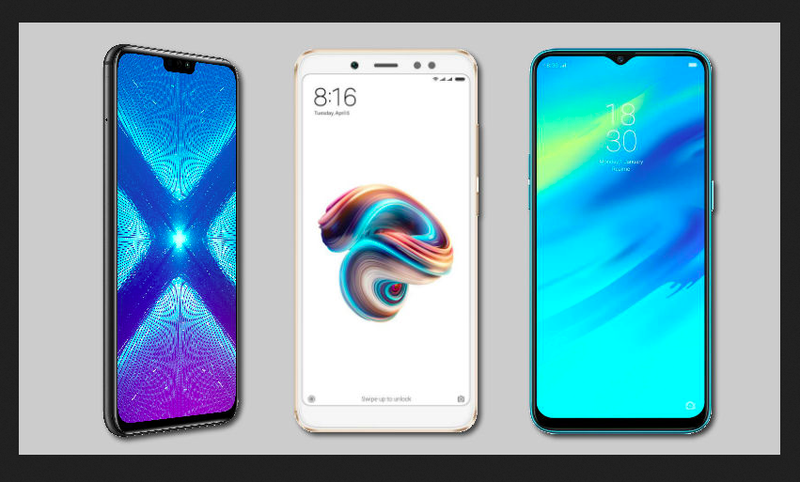 The new Honor 8X will be competing with the already existing Redmi Note 5 Pro and Realme 2 Pro Devices. Let's know what is the difference between these three smartphones, specifications and features. The Honor 8X 4 GB RAM and 64 GB storage variant is priced at Rs 14,999. 6 GB RAM and 64GB storage variant costs Rs 16,999, while 6 GB of RAM and 128 GB storage variant is priced at Rs 18,999. The sale of the phone will be exclusively on Amazon India from October 24. Redmi Note 5 Pro's 4 GB RAM variant costs Rs 14,999 while the 6 GB RAM variant is priced at Rs 16,999. The phone is found on MI.COM and Flipkart. The RealMe 2 Pro's 4 GB RAM variant is priced at Rs 13,990, the 6GB RAM variant costs Rs 15,990 and the 8 GB RAM variant is 17,990. The phone is found on Flipkart. Honor 8X has a glass back design and dual tone finish which gives it a premium look. At the same time, RealMe 2 Pro Polymer comes with glass back and is made of plastic and equipped with glossy finish. The Redmi Note 5 Pro comes with metal Finished. Redmi Note 5 Pro has a 5.99 inch Full HD 18: 9 display and is a no-noch phone. The screen's resolution is 1080x2160 pixels and the screen's density is 403pp. Honor 8X and Realm 2 Pro have a Nokia display. RealMe 2 Pro has 6.3 inch full HD display, Honor 8X has a 6.5 inch FullHD panel. Both have a resolution of 1080x2340 pixels and the aspect ratio is 19.5: 9. In Honor 8X, the smartphone comes with 64GB / 128GB inbuilt storage variant with 4 GB RAM / 6GB RAM. Redmi Note 5 Pro offers the option of 64GB with 4 GB of RAM and 6 GB RAM. Realme 2 Pro offers 4 GB RAM / 6GB / 8GB RAM while 64 GB / 128 GB inbuilt storage is available for storage. Inner 8X, the Kirin 710 octa-core processor has been given. The Redmi Note 5 Pro Snapdragon 636 processor, while the Realme 2 Pro offers snapdragon 660 processors. Talking about Photography, three smartphones have rear dual cameras. Honor 8X has 20 megapixel primary and 2 megapixel depth sensor. RealMe 2 Pro is equipped with 16 megapixel primary and 2 megapixel depth sensor. The Redmi Note 5 Pro comes with 15 megapixel primary and 5 megapixel secondary depth sensor. Talk about Selfie, Honor 8X and Realme 2 Pro have a 16-megapixel front camera. Radmi Note 5 Pro has a 20-megapixel front sensor. The three smartphones get a touch of Face Unlock feature. 3750mAh battery is given in Honor 8X RealMe 2 Pro has 3500mAh battery. To give power to the Redmi Note 5 Pro, the maximum capacity is 4000mAh. For connectivity, there are three smartphones, Bluetooth, GPS, Wi-Fi, Dual SIM card slot and 4G VOLETE options. Talking about the software, Honor 8X Android 8.1 runs on Oreo Based EMUI 8.1. The Redmi Note 5 Pro comes with Android Nougut Based Mi Skin. RealMe 2 Pro Android 8.1 runs on Oreo Based Color OS.